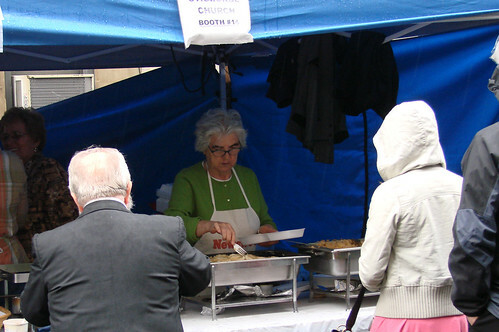 Last year, I hit up the St. George's Festival on a rainy Sunday afternoon. Even with the rain they ran out of their homemade borscht and the stuffed cabbage. It looks like there might be some rain in the forecast for this weekend, so this year I'll be wiser and at least go sooner in the day. 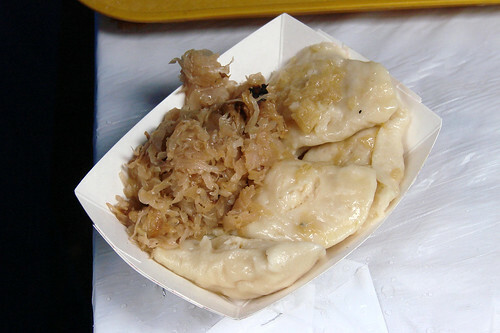 Four yummy, tender and buttery varenyky and a side of sauerkraut only cost me $2.50 last year. And come on, seriously, wouldn't you trust this lady to make you varenyky? May 15-17, 2009 on 7th Street between 2nd and 3rd Avenues. Daring Bakers May Challenge: It's Strudel Time! Happy Blogiversary City Sweet Tooth! A Victory for Cheese Lovers Everywhere!